The Jewish community in Canada, especially in Toronto, is exceedingly strong, but it must not shy away from using that strength, Alan Dershowitz says. 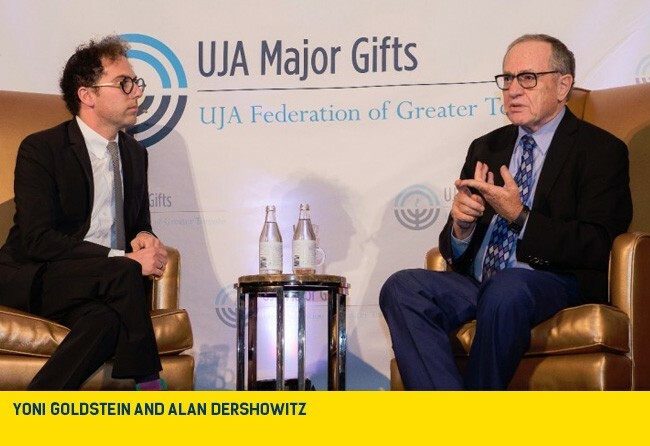 Known for his strong support of Israel, Dershowitz, the renowned American lawyer, author, political commentator and retired Harvard law professor, was the featured speaker at the United Jewish Appeal’s (UJA) major gifts dinner Oct. 19, held this year at Toronto’s Ritz-Carlton hotel. Following his address, Dershowitz was interviewed on stage by CJN editor Yoni Goldstein. “Canada is the only country in the world that understands with great moral clarity the difference between Hamas and Israel… for seeing moral clarity while others see moral ambiguity,” he added. The success and relative safety from anti-Semitism that the Canadian Jewish community and others in North American enjoy should not, however, make us complacent, Dershowitz warned, nor should it make us feel sheepish about denouncing anti-Zionism and anti-Semitism. To back this up, he cited the “blatant hypocrisy” of countries around the world who pilloried Israel for taking strong military action in Gaza this summer when, he said, Israel was acting just as any country in the world would under similar circumstances. “The difference is Israel does it better, more safely and with less civilian casualties,” he maintained. He spoke of increasing anti-Zionism on university campuses worldwide and growing support for the boycott, divestment and sanctions (BDS) movement, which he stressed is not, as some understand, a protest against Israel’s West Bank settlements, but an attempt to threaten Israel’s existence entirely. He said “anti-Zionism is the excuse du jour for anti-Semitism,” and is highly pervasive. He warned that, in the next year or so, the United States may make a “bad deal” with Iran, allowing it to continue developing rockets with nuclear explosive capabilities, and that for Israel, this will be an existential threat. Any attempt at pre-emptive action against this on Israel’s part, will make the latter even more unpopular internationally. He also predicted that in the summer of 2016, Hamas will strike Israel again, and that it’s important for Israel to be prepared. Every war Hamas fights with Israel, he said, “[Hamas] loses infrastructure and civilians, but they win the war of public opinion,” thus strengthening the group. Israel must, therefore, be anticipating “the next war,” he said, and the Diaspora must bolster Israel by digging deeply into its pockets and using all resources at its disposal. Goldstein joined Dershowitz on stage and asked to what extent the tunnels built by Hamas had “changed the game” in the recent war in Gaza. Dershowitz spoke of the sheer danger of tunnels built exclusively to kill and kidnap Israeli civilians and soldiers. He said Hamas leaders have already been bragging that they’re building new ones. Israel has its work cut out for it in terms of upgrading technology to protect its people, he added. Goldstein asked how the left’s rejection of Israel can be squared with the reality that many Jews consider themselves to be quite liberal. Lastly, Goldstein asked how Jewish leadership in places such as Canada and the United States can best help Jewish university students feel safer defending Israel on campuses. Dershowitz said the “main villains on university campuses” aren’t the “radical leftists,” but the Jewish professors who lack the courage to speak out in favour of Israel, fearful their reputations will be tarnished. Originally published in the Canadian Jewish News.